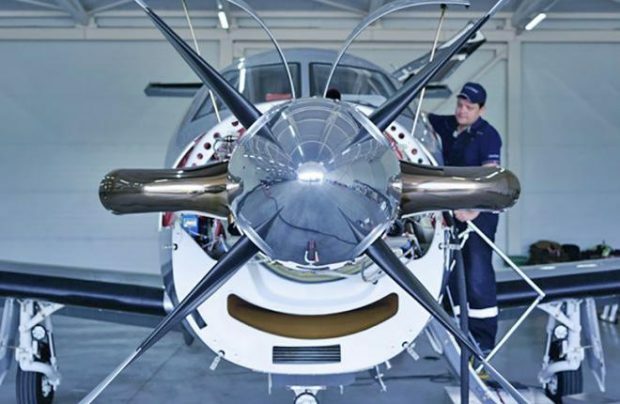 Nesterov Aviation, an authorised representative of Swiss aircraft manufacturer Pilatus Aircraft in Russia, has picked the first maintenance centre in the country to be approved to service PC-12 turboprops. The centre is based at Dobrograd airport in the Vladimir region, some 250 km east of Moscow, the company reports. Maintenance services will be provided by Skypro Helicopters’ technicians, each of whom successfully completed a training course in Switzerland earlier this year. The Skypro Helicopters (a subsidiary of the Skypro Group) technical centre is also certified to service and repair helicopters made by European aerospace group Leonardo. In May this year, it became an authorised MRO centre for AW109S/AW109E and AW109SP rotorcraft. Skypro Helicopters is currently working on the establishment of its authorised maintenance centre for PC-12s. As part of the preparations, the provider has already obtained a certificate for line maintenance and some forms of base maintenance activities for PC-12/47Еs and has been licensed by Russia’s aviation authorities to analyse and process PC-12 flight data on the premises at Dobrograd airport, Skypro Helicopters’ chief executive Petr Yablonsky has revealed to Russian Aviation Insider. The company is in the process of drafting technical requirements for the construction of the maintenance facility, with works due to begin in early 2019, and a launch date set for the second half of 2019. Talks are under way for Skypro Helicopters to also provide spares parts support to Pilatus-made aircraft, Yablonsky said. Eventually, Skypro Helicopters hopes to provide maintenance services for not only Russian, but also Belarus aircraft operators. Belarus’s newly formed business aviation operator BySky has two Pilatus PC-12 turboprops in its fleet. Skypro Helicopters already provides flight data analysis services to BySky. Meanwhile, Nesterov Aviation stresses that the establishment of a first Pilatus maintenance centre in Russia will help CIS-based operators of the Swiss-made aircraft to cut their maintenance times and costs. Skypro Helicopters will offer round-the-clock line and base customised maintenance services for all generations of PC-12s, with plans to expand the range to other Pilatus models. “In the near future we plan to get broader approval for a full range of base maintenance activities on PC-12/47Еs and to add PC-12/47 and PC-12/45 types that are in service with some operators in Russia,” Yavlonsky stated. “We intend to become proficient in the maintenance of PC-24s by the end of 2018. The aircraft is new to the Russian market where the first deliveries are not expected until the start of 2019. Today the company is putting effort into expanding its range of maintenance and repair services both for Leonardo Helicopters and for Pilatus,” he added. In 2015, Skypro Helicopters was licensed as a general aviation operator. It owns an AW139 medium-sized helicopter.